During my primary school years in the 1957 - 1963, the English teacher wanted us to study English idioms for examinations. One of them was "Make hay while the sun shines". Singapore does have plenty of sunshine but I had no idea what hay looked like. There were small pig and chicken farms in this era. Nowadays, travel and internet pictures broaden the minds of Singaporean children. I snapped this picture at the right time. It was on the bumpy road where golden rice fields lined the route. I don't know whether Singapore children still learn such idioms. 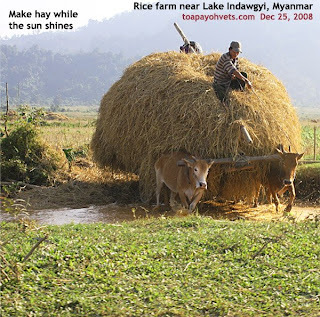 But "Make hay while the sun shines" still apply to living and business ventures. Only that, the financial people have been making lots of money out of ordinary people by structuring complex financial investment instruments bankrupting the retirees and even top notch investment companies and banks.